I don't care what anyone says, The Happening is one of the greatest films ever made, a terrific send-up of apocalyptic horror films and a delightful spoof of the genre. Oh, what's that...it WASN'T suppose to be a comedy? My bad. 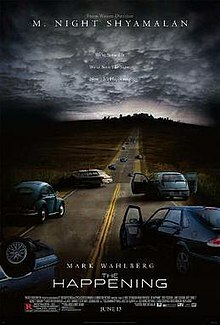 When I think of The Happening, I don't think of this turd of a film, filled with its own self-importance and 'meaning'. Instead, I think of a jaunty little number by The Supremes. The Happening is a good song. 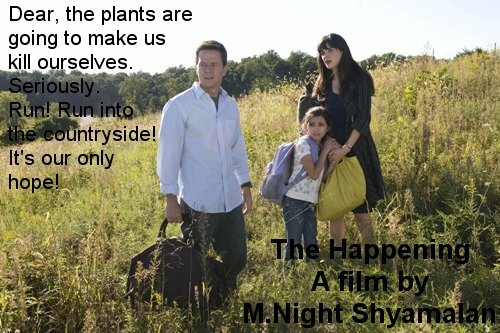 The Happening is a disaster in every way imaginable, as if M. Night Shyamalan, someone who apparently doesn't value his career anymore, wanted to spend the money given him and make just a terrible, terrible film...even by his mediocre standards. The wunderkind who once was hailed as the next Steven Spielberg is now looking more and more like the next Ed Wood. There are strange events going on in New England, particularly New York City. In Central Park, people suddenly freeze, look blankly, then commit horrific acts of suicide (they stab themselves with hairpins, throw themselves off buildings). Mass chaos ensues as the idea spreads that this is the work of 'terrorists' via some gas attack. Meanwhile, Philadelphia science teacher Elliot Moore (Marky Mark/Mark Walhberg), is explaining to his students the disappearance of bees when he hears of these 'attacks'. Sensing danger, he contacts his wife Alma (Zooey Deschanel) and decide it is best to go to Harrisburg for safety. 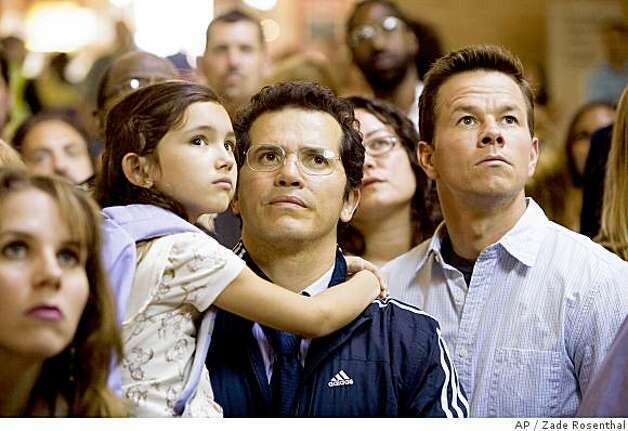 Taking the train, they are met by their friend Julian (John Leguizamo) and his daughter Jess (Ashlyn Sanchez). There is much danger within and without the train. Alma might be having an affair, and Julian cannot reach his wife. Eventually we learn that there are more victims, for this 'attack' is spreading. As a result, the train is forced to stop almost in the middle of nowhere, forcing the quartet to attempt to move on. Julian decides (after a long, long, drawn-out farewell) to leave Jess with the Moores while he goes to attempt to rescue his wife. However, after being involved in a car accident, Julian does what the others do and kills himself. The Moores and Jess eventually find others who are attempting to make sense of what is going on. They are met by among others Private Auster (Jeremy Strong) and a couple of kids, Josh and Jared (Spencer Breslin and Robert Bailey, Jr. respectively). Science teacher Elliot finally puts it all together: its the plants who are attacking humanity for reasons unknown. Somehow the plants are communicating with each other and launching a series of attacks that cause people to kill themselves. All the people have to do is stay ahead of the wind, Elliot Moore tells them. It just is hard to judge whether or not Shyamalan was serious when he made The Happening, whether he thought everything in it was either innovative or shocking or scary, or whether he thought it would be a lark to take the money given him, buy a house and car, then decide to throw feces on the screen for an hour and a half and try to pass it off as a real movie. One can watch The Happening in some sort of stupefied wonder as to how everything that could go wrong did go wrong, and I mean everything. Let's start with the performances. Mark Wahlberg has been hailed as a great actor, and an Oscar nomination for playing a version of himself in The Departed seems to have locked the deal. I have long argued that Marky Mark can't act, but is just a smarter version of Channing Tatum. Even if I granted that he could act, his performance was frightful: emotionalless, devoid of any sense, making his furrowed brow indicate all the range of a mannequin. Any person who shows no emotion when attempting to convince an audience that his character could seriously be attempting to reason with a potted plant is already doomed to failure. Of course, there is something to be said about Marky Mark playing the voice of logic and reason. Perhaps not since Charlton Heston played a Mexican in Touch of Evil or Mickey Rooney the buck-toothed Japanese photographer in Breakfast at Tiffany's has an actor been so wildly miscast as Wahlberg was playing a scientist. How smart could Science Teacher Elliot be if he didn't realize he was inside a model house? Actually, there is not one good performance in The Happening. Deschanel in her first scene looks comically crazed, as if she is still debating whether she was suppose to take any of this seriously. In turns idiot and deranged, Deschanel should ask that all copies of this film be destroyed less they come back to haunt her New Girl career. Leguizamo attempted to out-underact Wahlberg with his slow, dull Julian. They both looked almost shell-shocked, as if wondering how they could get out of this fiasco. His long farewell scene was so long at one point I actually wrote, "Oh, Leguizamo just GO already!" I hate going after a little girl, but Sanchez is simply the worst child actress of all time. There is nothing that excuses her lousy performance where even the most simple line readings were delivered in a bored, dead manner. I also hate going after old people, but Buckley's Mrs. Moore was just as idiotic. She (or Shyamalan) could never decide whether Mrs. Moore was human: she was a creepy old lady who appeared to be insane even before she met the killer pollen. She was comically crazy...and that seems to be a running theme throughout The Happening, how there were only two types of people occupying this world: either the comically crazy or the emotionally stunted. The story itself doesn't want to take things seriously. There is a subplot of Alma and Elliot's marriage being on the rocks. If I understand it correctly, Elliot is jealous when Alma confesses she had dessert with another man. DESSERT? How dare she partake in pastries without her single-expression husband? It reminds me of a scene from an episode of The Golden Girls, where Rose has gone to a fancy restaurant that her cheapskate boyfriend Miles only visits to pick up day-old pastries. When she is discovered by Miles, Rose begs his forgiveness. "I didn't mean to eat behind your back," she says. Alma might just as well have said that. It would have made as much sense as the introduction of a story that was ultimately irrelevant to anything going on. I also wondered why Julian had to constantly carry Jess around in his arms. At one point I actually wondered whether little Jess was capable of walking given Julian's insistence on carrying his ten-to-twelve year old girl all over the place. Characters pop in and out without reason, everyone was directed to play this as hyper-serious as possible and never show any real sense of emotion. We're asked to believe nonsense (such as when after a frightful crash, Julian can walk out of it with hardly a scratch before taking glass and slitting his wrists). James Newton Howard's score tries too hard to be spooky when it only adds to the ridiculousness of the entire project. There's taking things seriously, and then there's being serious to where it's unintentionally funny. The Happening goes for the latter, determined to make every wrong decision whenever it can. What can be said of someone who keeps making worse and worse films (The Village, The Happening, The Last Airbender, After Earth) and somehow is STILL being hired? The film is badly-written with an inane plot. The film is badly-directed, with some shockingly inept performances from the entire cast bar none. The Happening ultimately might not be the worse film M. Night Shyamalan has made, but for someone once touted as 'the new Spielberg', The Happening proves that reports of Shyamalan's genius were greatly exaggerated. it would be watch for sure. When I read the beginning of your review on the dashboard I was think, "I thought everyone absolutely hated this movie, I can't believe you liked it." Hilarious and perfect opening to the review. Fortunately, I have not seen the Happening and I will try to continue to avoid it. M. Night Shyamalan's movies have really sucked of late, has even he made a decent movie in the last few years?